The Vintage Gift Giver (ES1929S) is the second nutcracker in the Steinbach Gift Giver Nutcracker Series. The Vintage Gift Giver (ES1929S) is the second nutcracker in the Steinbach Gift Giver Nutcracker Series. 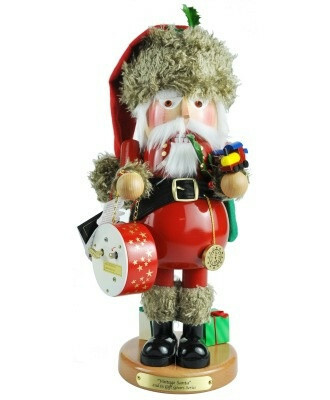 At 18” tall, this musical big-bellied Santa nutcracker carries gifts in both hands. He plays the classic song Jingle Bells. This is a limited edition nutcracker with only 5,000 pieces. This nutcracker also has a limited number signed by Karla Steinbach (ES1929S).